A carte-de-visite portrait of the bass Eugène Crosti, dressed for an unidentified role. 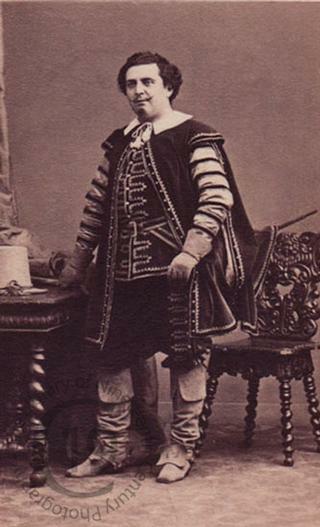 Given the costume, he is possibly seen here as one of the principals in Donizetti’s Maria Stuarda, based on Schiller’s life of the tragic Queen of Scots. He was later a professor of singing at the Conservatoire de Musique. In 1902 in Paris he produced Paillasse, his own translation of Ruggero Leoncavallo’s Pagliacci.